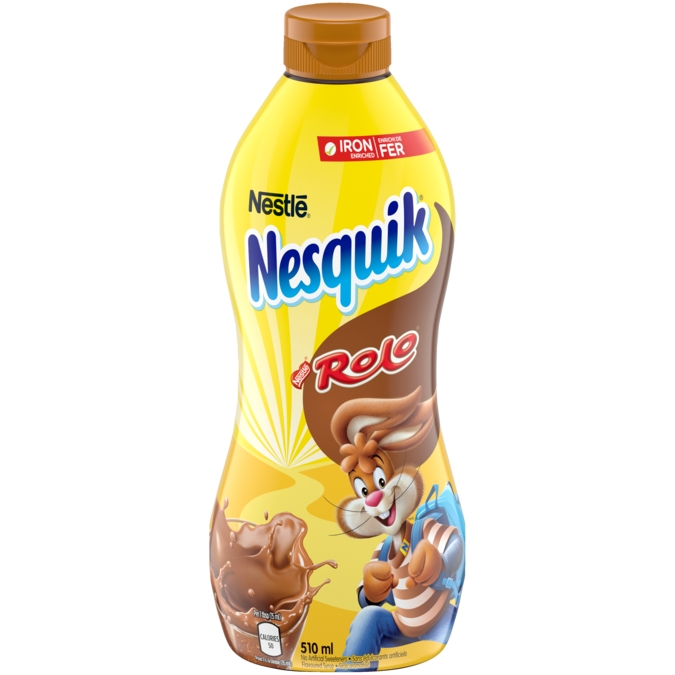 NESQUIK Iron Enriched ROLO Flavoured Syrup is a caramel twist on NESQUIK that’s sure to add delicious fun to your kid’s milk. Quick and easy, simply mix 1 tablespoon (15 ml) of syrup into 250 ml of milk for a delicious glass of ROLO infused milk! It’s a great complement to breakfast, enriched with iron to promote the maintenance of your kid’s good health. Enjoy NESQUIK as part a balanced breakfast, with a caramel twist of ROLO! Quick & easy: mix 1 tablespoon (15 ml) of syrup into 250 ml of cold milk — enjoy! Dissolves quickly in hot or cold milk. Enriched with iron to promote the maintenance of your kid’s good health. Spread some fun around by adding NESQUIK to other delicious treats like ice cream, yogurt and sliced fruit.